Chantel at My Sunshine Designs has been kind enough to donate a 3 Pack of Nursing Pads to help celebrate Baby K's 1st Birthday. I want to start of by saying a special THANK YOU to Chantel for her kindness in helping celebrate! 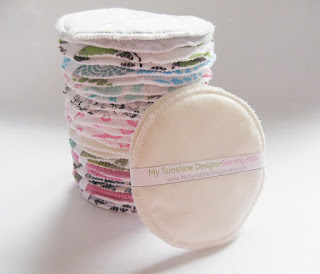 My Sunshine Designs makes eco-friendly and affordable handmade items in Canada! Chantel has been kind enough to open this giveaway item up WORLD WIDE!! !